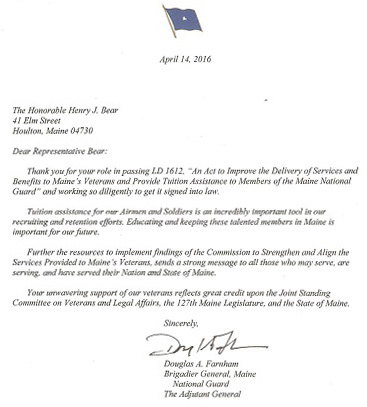 Thank you for your role in passing LD 1612, “An Act to Improve the Delivery of Services and Benefits to Maine’s Beterans and Provide tuition Assistance to Members of the Maine National Guard” and working so diligently to get it singed into law. Tuition assistance for our Airmen and Solders is an incredibly important tool in our recruiting and retention efforts. Educating and keeping these talented members in Maine is important for our future. Further the resources to implement findings of the Commission to Strengthen and Align the Services Provided to Maine’s Veterans, sends a strong message to all those who may serve, are serving, and have served their Nation and State of Maine. Your unwavering support of our veterans reflects great credit upon the Joint Standing Committee on Veterans and Legal Affairs, the 127th Maine Legislature, and the State of Maine.